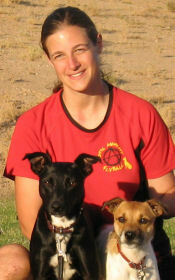 Sheri joined Total Anarchy in the summer of 2003 with a previous dog, then helped out as a box loader and alternate handler until Ping made her debut in September 2006. Now, Sheri really has her hands full with Ping and Savvy racing full time, and Jenga getting ready to burn up the race lanes! Sheri also volunteers her time and computer skills to keep our website operational.